Miyamoto Musashi was a 17th Century samurai who is best known for his epic treatise on the martial arts, "The Book of Five Rings". 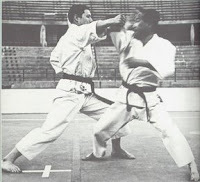 Interestingly, there are no physical techniques described, but one of the main tenets of this famous work is that one must train diligently. "You can only fight the way you practice," says the author. How you perform your martial art will be a reflection of how you train. Shugyo is the Japanese word for severe training. This type of training is designed to push the student to his or her physical, mental, and emotional limits. Other types of training performed out of the dojo could include running, weightlifting, and stretching, all of which have the added benefit of producing good health. Training should never be overlooked or taken lightly by the serious martial arts student.